The start of the new year is traditionally the time when we make resolutions to improve our lives, and it’s also the perfect time to think about updating your home. You’ve hopefully had a nice break from work and are feeling refreshed and full of optimism for the coming year, so turn your thoughts to some interior design. Why not start with the kitchen! The kitchen is considered the heart of the home so why not inject some style with a new worktop. We have plenty to choose from, whether you’re after a classic look or something more modern. Take a look at our quartz and granite ranges, from manufacturers like Silestone, Caesarstone and Compac. How to Choose your worktop! There are a few things to consider when choosing your worktop, it’s a big investment so you need to make sure it’s perfect. Firstly decide whether you want quartz or granite. Look at the pro’s and con’s of both, we can offer advice if you’re unsure, then you can pick your worktop from our wide selection, including marble-effect, plain, patterned and even sparkly! Quartz is a man-made material, composed of 93% quartz and 7% resin, giving a highly durable and practical worktop that will withstand everyday use and still look beautiful. It is treated to make it stain and scratch resistant, and is very easy to keep clean – just a wipe down with a damp cloth is all that’s needed. No chemicals or abrasives. The range of colours, patterns and finishes is huge, so you’re sure to find something that’s perfect for your home. 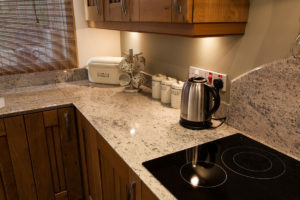 Our quartz worktops also come with a manufacturers guarantee, at least 10 years, so you have added peace of mind, and if the worst should happen and you damage your worktop, we offer a repair service. Granite, on the other hand, is a natural material that is mined and cut into slabs for use in our homes. Each slab is totally unique and has its own pattern variations, making it more expensive but more sought after and luxurious. Granite is seen as a more exclusive worktop but is now more affordable so should not be overlooked. While not quite as durable as quartz, its looks make up for that. It will need sealing to maintain its beauty and stain resistance. 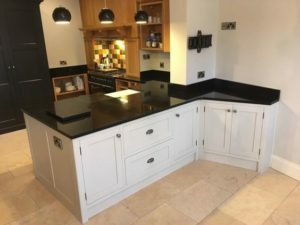 Whether you choose quartz or granite, having one of our quality stone worktops will not only make you the envy of your friends and family but will add value to your home. Take a look at our ranges to see just how beautiful they look. We can even send you samples to help you choose. When you’ve decided, we can give you a price and our team of expert fitters will come out to template your kitchen before returning to fit your beautiful new worktops. The kitchen of your dreams is achievable with C & J Stonemasonry.